This module determines when you want particles to disappear. 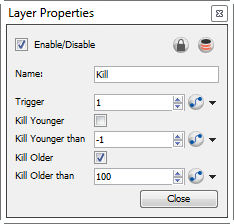 Use the Kill Module's Layer Properties panel to adjust the effect's parameters. • Kill Younger: There are only a couple of specific scenarios where you might want to use this property. In order to make use of Kill Younger, you would generally want to attach a function to this property. The reason for this is, if you just turn on a "Kill Younger" right away at time 0, then you'll never see any particles. For example say that you set Kill Younger to 10, at time 0, there will be no particles that are older than 10, so you'll never see any particles. What you might want to do, however, is have your particles animating over time, and at some point in time, you may suddenly want to kill all the younger particles. Let's take the example of an animation where the particles change from blue to yellow. At every frame, new particles are generated, and the particles that already exist age. 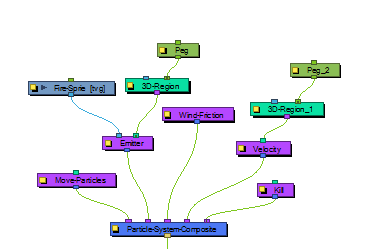 There might come a point, perhaps where you do something like an explosion, where you want to kill all the particles that are younger than 10 frames old - so in my example it would kill all of the blue particles, leaving only the yellow particles. • Kill Younger Than: This is where you could animate the effect for "Kill Younger." • Kill Older: When this option is checked, particles will disappear when they reach a certain level of maturity. • Kill Older Than: Set the age at which particle will disappear.